The Phoenix mission held a televised press conference this morning. A. J. S. Rayl will be writing up a detailed report later, so I'll just post some of the highlights here. 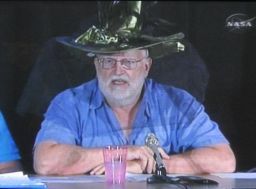 Michael Meyer was there from NASA Headquarters to formally announce that the mission is being extended through the end of the fiscal year -- to September 30, or sol 124. This is a 34-sol extension over the original timeline, but it is probably not the end of the story, considering that the camera team is already counting on operating into November (more on that below). He said this extension will cost $2 million. The best news came from Bill Boynton, who said that TEGA actually got some ice into oven 0 on sol 64. This was unexpected. They had given up, for the moment, on getting a rasped sample collected and out of the scoop; they wanted to move on to collect more surface samples while they work on the rasping and delivery technique. So they scraped a sample from the area where they've been working in Snow White in recent days and dumped it onto TEGA and got enough for the oven to close. In their very first analysis, lo and behold, there was water. Just a couple of percent by weight -- and not enough to determine the D-to-H ratio, an important measurement for TEGA -- but still, it's their first water sample, so, hooray! On sol 64, Phoenix dumped a sample called "Wicked Witch," taken from the floor of the Snow White trench, onto the open doors of TEGA oven 0. This time, enough sample was delivered for the oven doors to shut. To everyone's surprise, there was one to two percent ice present in the sample. The Atomic Force Microscope hasn't yet analyzed a sample; Peter Smith said it is "just about ready to start." There was an awesome movie release taken late on the Martian night, where you can see the lidar beam from the meteorological instrument shooting off into the sky. You can download that and a lot of other really cool movies from the Phoenix website here. Some other favorites from today are one showing how a sample gets delivered to TEGA -- it's even more complicated than I realized -- and one showing how the camera builds up color images. All are in Quicktime format. They also released their version of the Mission Success Panorama, also known as the "Peter Pan." Some data about this panorama: it took 100 different camera pointings, 500 different images, it's full color and stereo, 150 Megapixels, and represents 100 Megabytes of downlinked data, requiring the equivalent of 15 whole radio communications passes, accomplished over a spread of 30 sols. They're getting started on the next, even better version of the panorama, to be called the "Happily Ever After Pan." It will include 1500 images, through all of the camera's filters at high quality, and comprise 600 Megs of downlinked data, or 100 radio relay passes worth. I still like James Canvin's version better, but you can download the official version (all 61 MB of it!) here. They're going to get started on two new trenches. 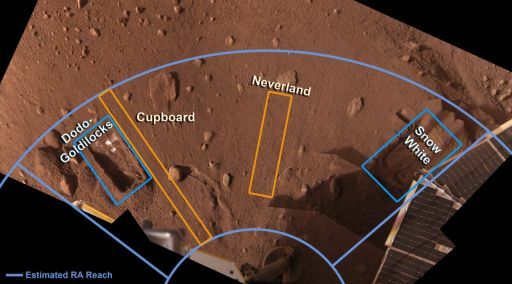 The first, called "Cupboard," will be adjacent to the Dodo-Goldilocks trench, near the left edge of the work volume, where they'll be looking at the edge of a polygon. The second, called "Neverland," is in the middle of the work volume, and will start just below a largish rock; Peter said that the presence of rock may modify the shape of the ice table below it. This map of Phoenix' robotic arm work volume delineates the trenches made up to sol 64 (Dodo-Goldilocks and Snow White) and the areas identified for future trenching (Cupboard and Neverland). Also, the team released an animation a couple of days ago that shows slight changes to the "Snow Queen" spot near one of the lander footpads over the course of 23 sols. 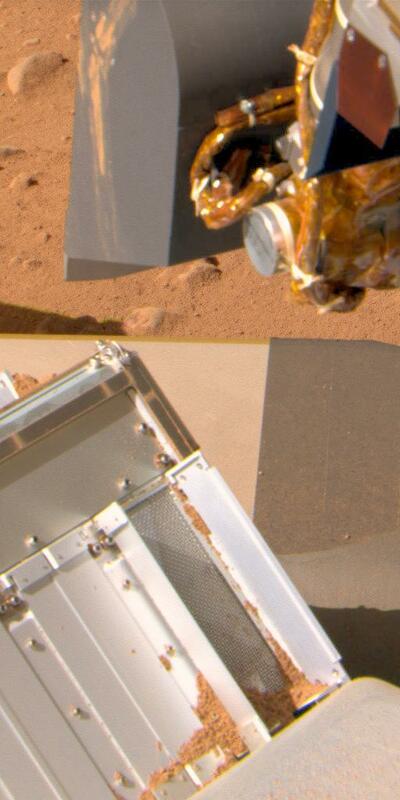 When Phoenix landed, its thrusters blew soil away from its landing site, exposing these platy structures named "Snow Queen" by the science team. This animation cycles between two images taken on sols 21 and 44. In that time, cracks appeared on the surface of the platy layers; a pebble seems to have been extruded from one crack; and the surface has "subtly roughened." These changes support the notion that the plates are icy material that is sublimating; it's possible there is also some re-deposition of ice at times. Finally, I'll mention something that wasn't discussed at today's press briefing. The mission has now posted to a public archive the navigational data that describes Phoenix' trip to Mars, including its entry, descent, and landing. 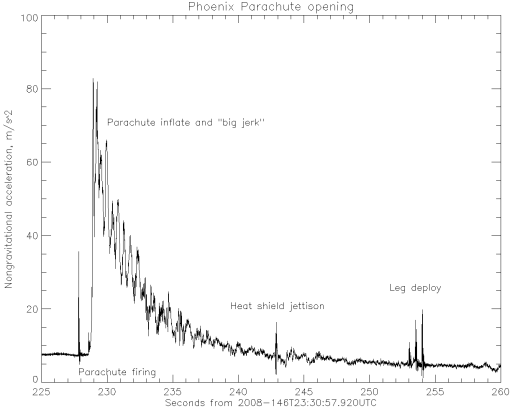 Below is one nifty graph showing the accelerations felt by Phoenix near the time of the landing. If you would like to get your hands dirty with this data, you can download a 90,000-line .CSV formatted file (4 MB, Zipped) of data taken at 5-millisecond intervals. It's not for the faint of heart -- Excel won't even handle a data file that large, it has to be split into two chunks first. [EDIT: it has been pointed out to me that if I were using Excel 2007 I wouldn't have that problem. But the Society is poor and I'm still using Office 2003, which has a 2^16 line limit.] But I offer the link for you hard-core geeks out there. This graph is based upon data posted to NASA's Navigation and Ancillary Information Facility (NAIF) for Phoenix' trip to Mars, including the entry, descent, and landing. 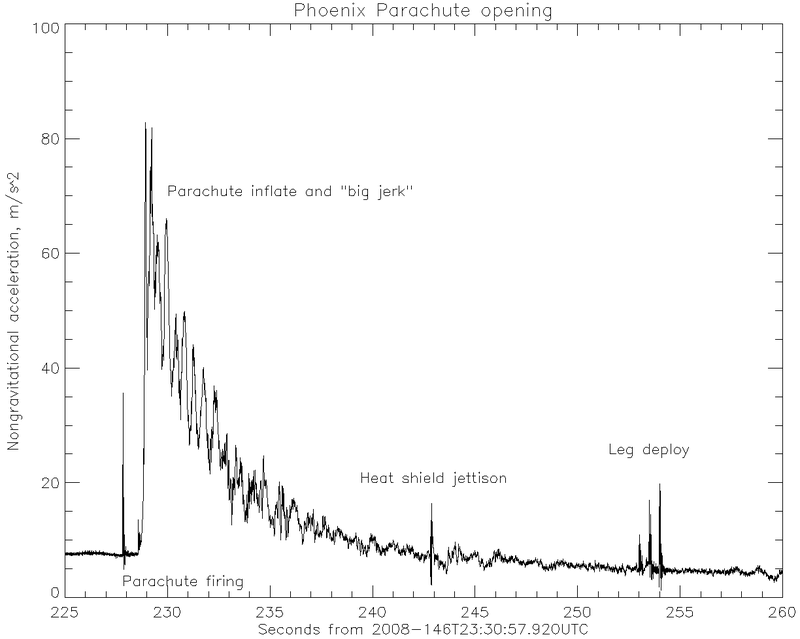 It recorded a cosntant deceleration of about 7.5 m/s2 until the pyros fired to release the parachute; a second later, there is a huge jerk to 80 m/s2 as the parachute inflateed. The spacecraft jerked and tugged below its chute with decreasing violence as the spacecraft descended. At the 243-second mark the heat shield was jettisoned, causing another small jerk. Then, at 253, 253.5, and 254 seconds, the three lander legs extended.